What Is Indian Flatbread Called? The popularity of Indian food continues to grow in the U.S.
1 What Is Indian Flatbread Called? Indian food is fast becoming one of the most popular choices for restaurant and takeout dining. The wide variety of flavors and textures available in Indian food make it a universally popular cuisine, from creamy sauces to crispy fried breads, vegetarian dishes to delicious meats. The cuisine of India is certain to please almost anyone, regardless of taste and diet. The word "tikka" means pieces or morsels, and that's exactly what tikka masala is: morsels of marinated chicken added to a rich, cream gravy. The marinated chicken is grilled before being added to the spice-laden cream gravy, imparting a smoky flavor. 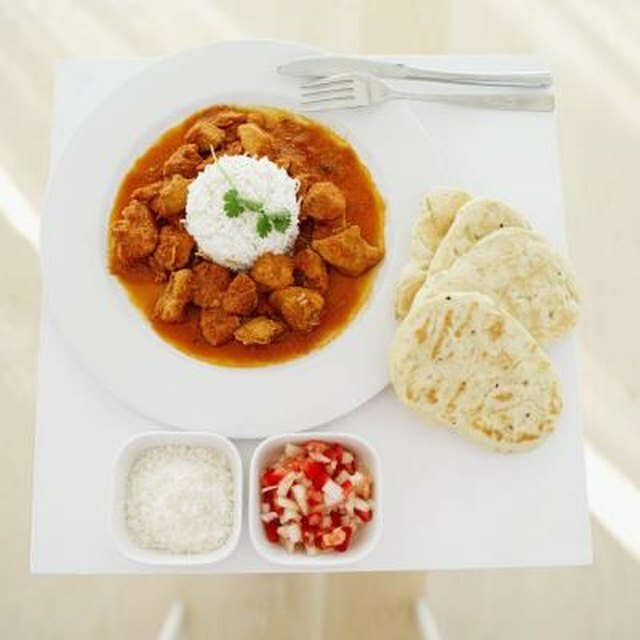 Typically served with rice or naan, which is Indian flat bread, tikka masala is one of the most popular dishes served at Indian restaurants and is very easy to make at home. One of the most popular vegetarian Indian dishes is malai kofta, vegetarian meatballs made of potatoes, vegetables, Indian cheese called paneer and a variety of spices. The meatballs are fried, then added to a light spicy gravy flavored with tomatoes, fenugreek, garam masala, onions and many other herbs and spices. The dish is best served with naan. Perhaps one of the most famous Indian foods, tandoori chicken is named for the special stove that it is cooked in, called a tandoor. The dish features a whole chicken marinated in yogurt, tandoori masala, garlic paste, salt and chaat masala, cooked in a tandoor oven. Modern versions of the recipe can be cooked in a conventional oven with surprisingly authentic results. Palak paneer is another popular vegetarian dish that is as healthy as it is delicious. The dish is cubes of paneer—or Indian cheese—simmered in a thick spinach and herb gravy, typically served with chapatis, or Indian flat breads. Originating in North India, palak paneer tends to be very spicy and must be eaten with a starchy accompaniment to cut the heat. Can I Make Salisbury Steak Using Hamburger Patties?